Les Arcs is a multi level resort in the Paradiski Area of France, boasting 425km of skiable runs ranking it World No.2 for KM of runs. The beauty of Les Arcs is the variety it provides with 5 areas: ARC 2000, ARC 1950 LE VILLAGE, ARC 1800, ARC 1600 (CAR-FREE) & BOURG SAINT MAURICE, each with it’s own style. The resort is known for snow reliability with altitudes up to 3250m, along with extensive snow making facilities. Designed like a high-mountain refuge, this site is set beneath the Aiguille Rouge, Les Arcs’ highest peak (3226 m). 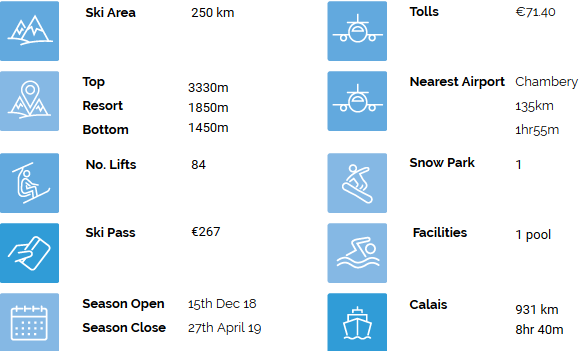 A freeride mecca and ideally situated to getting the most out of the Paradiski area, it truly is a paradise for the ski-obsessed. The youngest and most atypical of the resort’s 5 sites, Arc 1950, Le Village (5*) is a little like a timeless bubble with a fairy-tale touch. It has been specifically designed to make holidays as easy as possible for its guests. Consisting of four car-free centres on the edge of the forest built along the slope to offer balcony-like views of the Haute-Tarentaise valley, Arc 1800 offers the widest choice of boutiques, restaurants, après-ski activities and opportunities for festive evenings. Les Arcs’ architectural laboratory, the site where it all started, a village where the spirit of Les Arcs is manifest. Directly connected by the funicular and Bourg Saint Maurice railway station to Europe’s capital cities (Paris, London, Brussels and Amsterdam). Capital of the Haute Tarentaise and Les Arcs’ base camp. Its international railway station is directly linked (by TGV, Thalys & Eurostar) to the main European capitals. You can travel from the station platform to the ski slopes in 7 mins on the funicular.